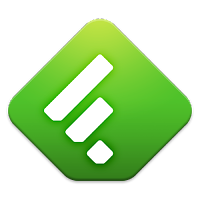 ... to find an alternative to Google Reader in order to receive the updates from all your favorite blogs. As you probably know the Reader service will be discontinued on July 1st. While Reader is still working, you can use it to import your favorites easily and save yourself from the hassle of having to redo it all manually. These past months I have been trialling 2 solutions and thought it would be interesting to let you know how I liked them. A well known one for beauty bloggers! Import is done in one click once your account has been created, and lots of bloggers including myself have a Bloglovin button on their page that allows you to add new blogs easily. You can categorize blogs for easier browsing. There is a picture from the blog post shown in the summary. There is a "mark all as read" button. You have "like" and "share" features under every post. If you open a blog it does so under a bloglovin URL and for me that sometimes lead to making it impossible to comment, not sure if that's me. I also have no idea about how that translates into Google Analytics statistics - but that doesn't matter for the readers, really. I was recommended this one on a more technological community and it has become my go-to. The iPad app is FABULOUS, allows you to turn your posts like pages until you reach the end of the list. I find the computer version less user-friendly than the iPad app. Hopefully this helps you find another solution you like so we can keep in touch after July 1st!